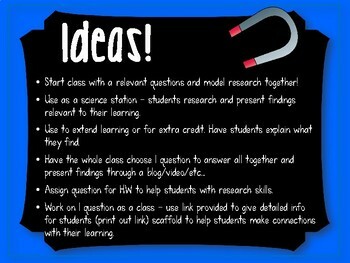 Engaging students in research has never been easier! Science and research go hand in hand and now students are begging to do more! 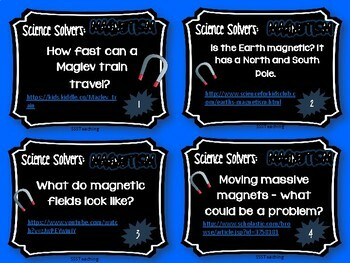 These research cards take the hard work out of research and provide students with tools to expand their scientific thinking and take it to the next level. Students, a class, or partners can research EXCITING, thought provoking and relevant science around a topic they are learning while picking up valuable research and presentation skills! 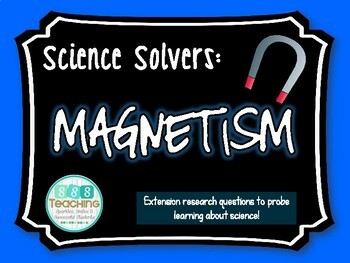 This resource is all about Magnetism! 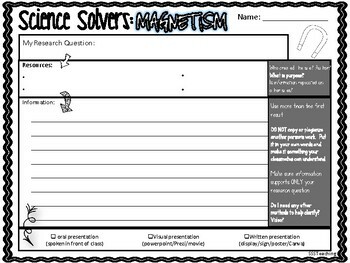 Included in this resource are 12 topic cards in color and B/W, ideas of how to use specifically in your classroom, recording sheets for all 12 or just 1 question with and without research prompts, along with ideas for presentation of findings to the class. This resource is a game changer for science! Click on “My TPT” then “My Purchases” in the upper right corner. Beside each you’ll see “provide feedback” – it should be blinking. Click and you can rate the product and leave comments about what you think. I love hearing your feedback on products! *Click the green star near my store name for product updates and premieres! *Follow my blog SSSTeaching for teaching ideas and pictures of what is going on in my classroom. *You can also find me on Facebook (exclusive offers), Pinterest, and Instagram!